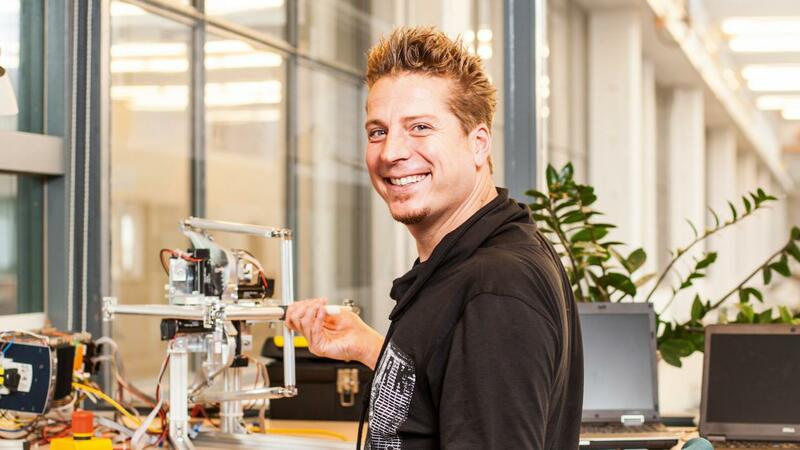 Professor David Abbink has been named full professor of Haptic Human-Robot Interaction at the Department of Cognitive Robotics (CoR) starting 13 February 2018. The focus of Abbink’s research is on how humans and robots interact and co-operate. Within CoR, Abbink works on robotics that are useful to society and individual users, specifically in environments in which people could come into contact with robots, such as the operation of intelligent vehicles or (remotely controlled) robot arms. David Abbink is head of the Delft Haptics Lab, where researchers are designing and evaluating intuitive user interfaces based on shared control and haptics (force feedback). These interfaces enable humans to have a better understanding of what an intelligent vehicle or robot arm capabilities and intentions, and vice versa, which makes it possible for humans and robots to support and learn from each other. David Abbink earned his master’s degree in 2002 at the Department of BioMechanical Engineering and obtained his PhD there in 2006 with his thesis Neuromuscular Analysis of Haptic Gas Pedal Feedback, which was also awarded best Dutch PhD thesis in Human Movement Sciences. The research led to a prototype for a gas pedal that allowed drivers to feel the changing separation to a lead vehicle, which Nissan released on the market in 2008. Abbink also contributed to the first steer-by-wire car in partnership with Nissan and his colleagues. David Abbink received both a Veni and a Vidi grant and has great passion for teaching. He was twice named ‘best lecturer of 3mE’ and has been elected ‘best lecturer of BioMechanical Engineering’ seven years in a row. His course ‘The Human Controller’ received an international award for ‘Outstanding Open Courseware’.